I never knew this, but stored procedures have versions. Hmmm, I read the entry and it says the number is an integer that is used to group procedures of the same name. There is a note this is a deprecated feature that may be dropped, should not be used for new work, and old work ought to be modified, but it was interesting, so I tried it. You can see these will have different results. If I execute them, I do so with the name, including the optional integer. 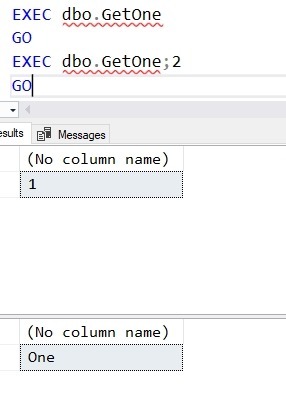 In SSMS, there is only one object listed. If I drop the procedure, both are gone. I’m not completely sure where I’d use this feature, and I can see not investing in it, but I found this fascinating. 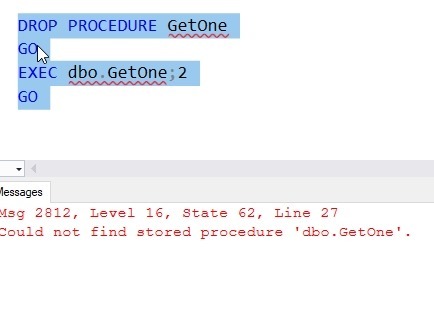 All these years of writing stored procedures and I learned something new this week. This entry was posted in Blog and tagged syndicated, T-SQL. Bookmark the permalink. — Incorrect syntax near ‘;’. — Cannot drop the procedure ‘#NumberedProc;2’, because it does not exist or you do not have permission. So… there is a use case that is immediately obvious but isn’t good. Attacker wants to build scripts and leave them on the SQL server where they remain pretty much undetectable… that way he doesn’t have to figure things back out when he visits again. This feature helps with that. That’s right where I went, too. Well, really as a practical joke to a fellow developer. Create a slightly-off version of a proc first, then modify the second one slightly and use that as the main one in the code, but only the second one returns the correct results. It’s a real jerk move, to be sure, but it could be a funny practical joke if you have the time and the right personalities that you’re working with. Otherwise, yeah, it’s really only a big security nightmare. I can’t think of a good reason do to this, especially as your calling code has to change and there isn’t any immediate benefit I see.